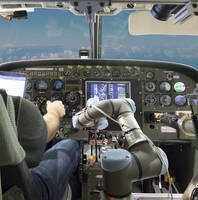 MANASSAS, Va., Oct. 17, 2016 - Aurora Flight Sciences is breaking ground in the world of automated flight through its work on the Aircrew Labor In-Cockpit Automation System (ALIAS) program. On October 17 Aurora demonstrated automated flight capabilities with ALIAS flying a Cessna Caravan through basic maneuvers under the supervision of a pilot. Aurora's ALIAS technology has now been successfully demonstrated on three separate aircraft, from three original equipment manufacturers, in less than twelve months.